Background: Exacerbations of chronic obstructive pulmonary disease (COPD) are a major driver of decline in health status and impose high costs on healthcare systems. Action plans offer a form of self-management that can be delivered in the outpatient setting to help individuals recognise and initiate early treatment for exacerbations, thereby reducing their impact. 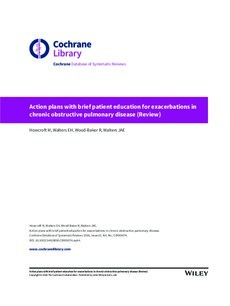 Objectives: To compare effects of an action plan for COPD exacerbations provided with a single short patient education component and without a comprehensive self-management programme versus usual care. Primary outcomes were healthcare utilisation, mortality and medication use. Secondary outcomes were health-related quality of life, psychological morbidity, lung function and cost-effectiveness. Search methods: We searched the Cochrane Airways Group Specialised Register along with CENTRAL, MEDLINE, Embase and clinical trials registers. Searches are current to November 2015. We handsearched bibliographic lists and contacted study authors to identify additional studies. Selection criteria: We included randomised controlled trials (RCT) and quasi-RCTs comparing use of an action plan versus usual care for patients with a clinical diagnosis of COPD. We permitted inclusion of a single short education component that would allow individualisation of action plans according to management needs and symptoms of people with COPD, as well as ongoing support directed at use of the action plan. Data collection and analysis: We used standard methodological procedures expected by Cochrane. For meta-analyses, we subgrouped studies via phone call follow-up directed at facilitating use of the action plan. Main results: This updated review includes two additional studies (and 976 additional participants), for a total of seven parallel-group RCTs and 1550 participants, 66% of whom were male. Participants' mean age was 68 years and was similar among studies. Airflow obstruction was moderately severe in three studies and severe in four studies; mean post bronchodilator forced expiratory volume in one second (FEV1) was 54% predicted, and 27% of participants were current smokers. Four studies prepared individualised action plans, one study an oral plan and two studies standard written action plans. All studies provided short educational input on COPD, and two studies supplied ongoing support for action plan use. Follow-up was 12 months in four studies and six months in three studies.When compared with usual care, an action plan with phone call follow-up significantly reduced the combined rate of hospitalisations and emergency department (ED) visits for COPD over 12 months in one study with 743 participants (rate ratio (RR) 0.59, 95% confidence interval (CI) 0.44 to 0.79; high-quality evidence), but the rate of hospitalisations alone in this study failed to achieve statistical significance (RR 0.69, 95% CI 0.47 to 1.01; moderate-quality evidence). Over 12 months, action plans significantly decreased the likelihood of hospital admission (odds ratio (OR) 0.69, 95% CI 0.49 to 0.97; n = 897; two RCTs; moderate-quality evidence; number needed to treat for an additional beneficial outcome (NNTB) 19 (11 to 201)) and the likelihood of an ED visit (OR 0.55, 95% CI 0.38 to 0.78; n = 897; two RCTs; moderate-quality evidence; NNTB over 12 months 12 (9 to 26)) compared with usual care.Results showed no significant difference in all-cause mortality during 12 months (OR 0.88, 95% CI 0.59 to 1.31; n = 1134; four RCTs; moderate-quality evidence due to wide confidence interval). Over 12 months, use of oral corticosteroids was increased with action plans compared with usual care (mean difference (MD) 0.74 courses, 95% CI 0.12 to 1.35; n = 200; two RCTs; moderate-quality evidence), and the cumulative prednisolone dose was significantly higher (MD 779.0 mg, 95% CI 533.2 to 10248; n = 743; one RCT; high-quality evidence). Use of antibiotics was greater in the intervention group than in the usual care group (subgrouped by phone call follow-up) over 12 months (MD 2.3 courses, 95% CI 1.8 to 2.7; n = 943; three RCTs; moderate-quality evidence).Subgroup analysis by ongoing support for action plan use was limited; review authors noted no subgroup differences in the likelihood of hospital admission or ED visits or all-cause mortality over 12 months. Antibiotic use over 12 months showed a significant difference between subgroups in studies without and with ongoing support.Overall quality of life score on St George's Respiratory Questionnaire (SGRQ) showed a small improvement with action plans compared with usual care over 12 months (MD -2.8, 95% CI -0.8 to -4.8; n = 1009; three RCTs; moderate-quality evidence). Low-quality evidence showed no benefit for psychological morbidity as measured with the Hospital Anxiety and Depression Scale (HADS). Authors' conclusions: Use of COPD exacerbation action plans with a single short educational component along with ongoing support directed at use of the action plan, but without a comprehensive self-management programme, reduces in-hospital healthcare utilisation and increases treatment of COPD exacerbations with corticosteroids and antibiotics. Use of COPD action plans in this context is unlikely to increase or decrease mortality. Whether additional benefit is derived from periodic ongoing support directed at use of an action plan cannot be determined from the results of this review.